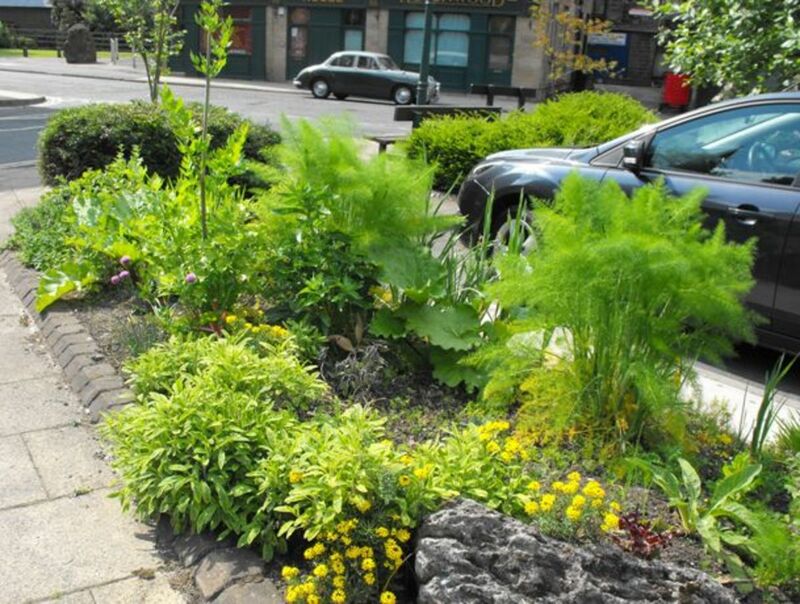 Most of us are used to walking through public places such as parks, villages, towns etc and seeing flower beds and borders that the local authorities have put in place to improve the appearance of the area. 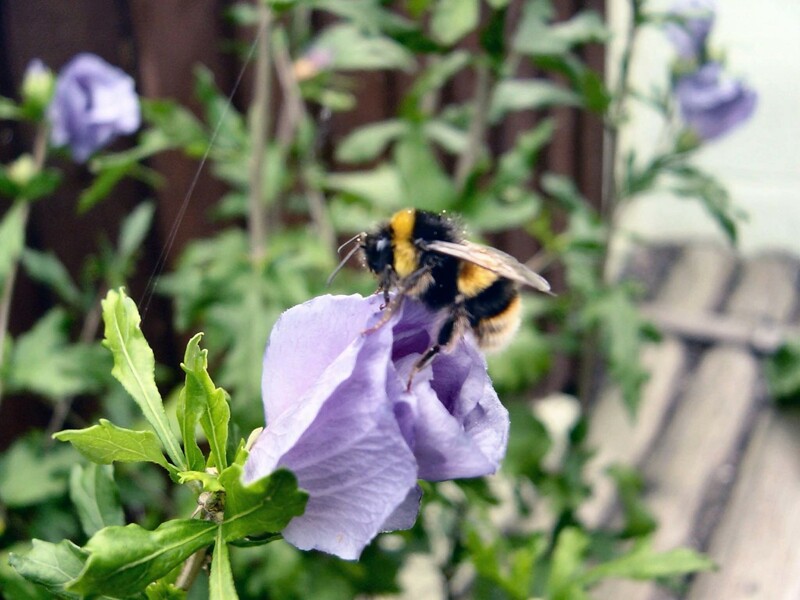 These usually consist of either shrubs, shrubs combined with flowers or just annual flowering bedding plants. Every year the annual flowers are replaced with new ones to create another colourful display. Of course the effect is very nice, and few if any would complain at seeing such a bright and cheerful 'public garden', but what if there was an even better idea......... what if you were to replace a large amount of those flowers with vegetables and then encourage the local residents to simply help themselves to any they needed whenever they wanted to? Mary Clear inspects one of the public vegetable containers. 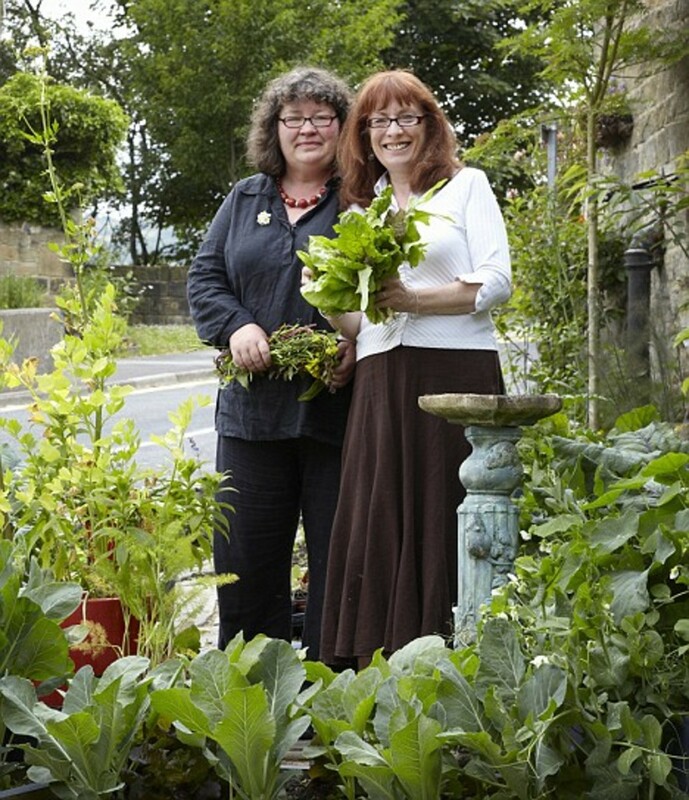 This might sound at first like a strange idea, but it has already been done in the English village of Huddersfield, who themselves were inspired by a similar project in another English village called Todmorden (which was featured on the Hugh Fearnley-Whittingstall television series River Cottage). 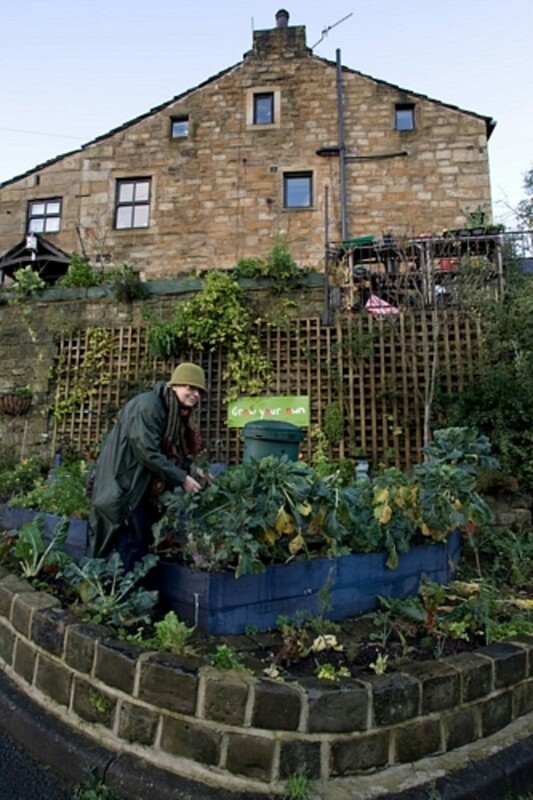 Hugh met the women in Todmorden who were reclaiming wasteland in a bid to make their town self sufficient, Pam Warhurst and Mary Clear's mission was to make their West Yorkshire town, Todmorden, self-sufficient in staple foods. Within 10 years they aimed to have their community producing and buying their own fruit, vegetables, meat and dairy products. 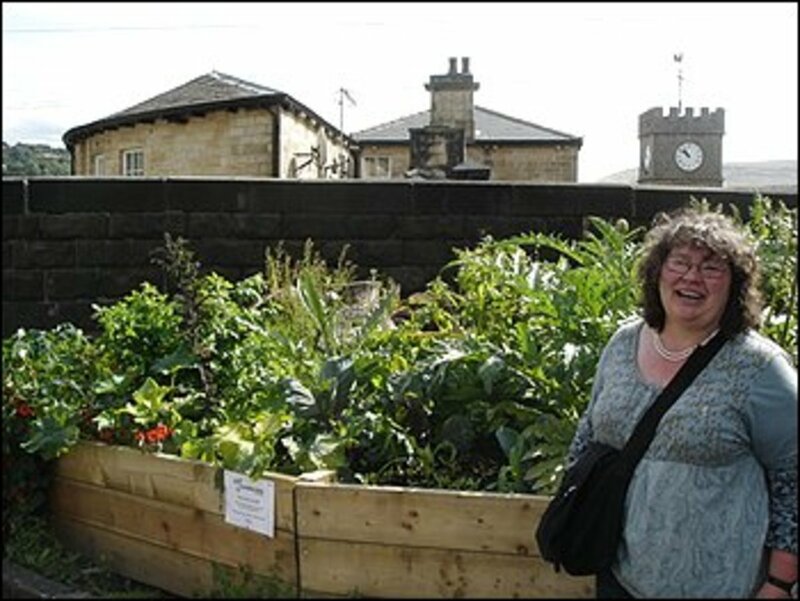 Norah Hamill was one of the founders of the Huddersfield project, (having previously been involved in the Todmorden project when she lived in the town), their ideal being that "The future can be incredible - and edible! We all have to eat and yet few of us grow our own food any more. But if we are to reduce food miles, minimise the impact of agriculture on the environment and save the planet then that will have to change". Norah gives up her time free of charge in order to promote the idea that we should all be planting vegetables anywhere, in fact everywhere, our gardens, schools, communal flower beds, graveyards, roadside verges etc. 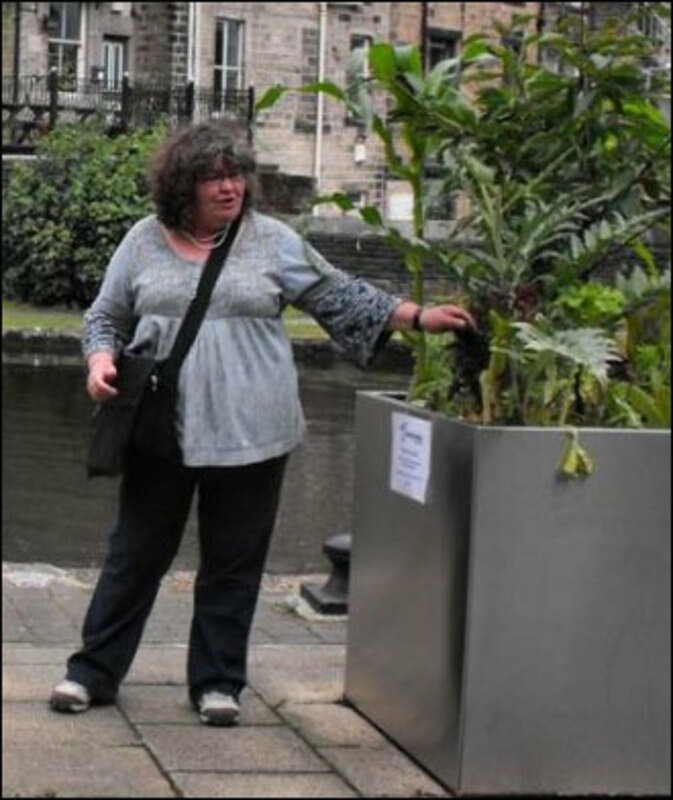 The project is called 'Incredible Edible Huddersfield' and echoes the name that Todmorden adopted 'Incredible Edible Todmorden'. Incredible Edible promote what they call 'Guerrilla Gardening', using any land available, be it waste ground, bus stops or grass verges, (with or without permission). In Huddersfield they have even invited shop and cafe owners to have vegetable planters outside their establishments. The produce is free to anyone to harvest as they need it, and although there has been the occasional act of vandalism, the organisers are not deterred and see this as potentially educational in itself. After all, if they pull up a carrot at a bus stop Norah stills sees this as part of the educational process as to where food comes from. Support for the initiative has come from many sources, including staff at the Pound World shop in Huddersfield, who clubbed together to donate seeds. “We’ve had donations of spades and seeds and we’ve got people who grow seedlings. I am really determined about this,” added Norah, who is taking a course in permaculture (permanent agriculture) at the Permaculture Society in Hebden Bridge. “The permaculture movement is based on three principles: care of the earth, care of its people and fair shares for everyone. It’s about how to manage the earth and ensure sustainability,” she explained. Imagine going to your local cemetery to pick some runner beans, or the public car park to pick cherries! 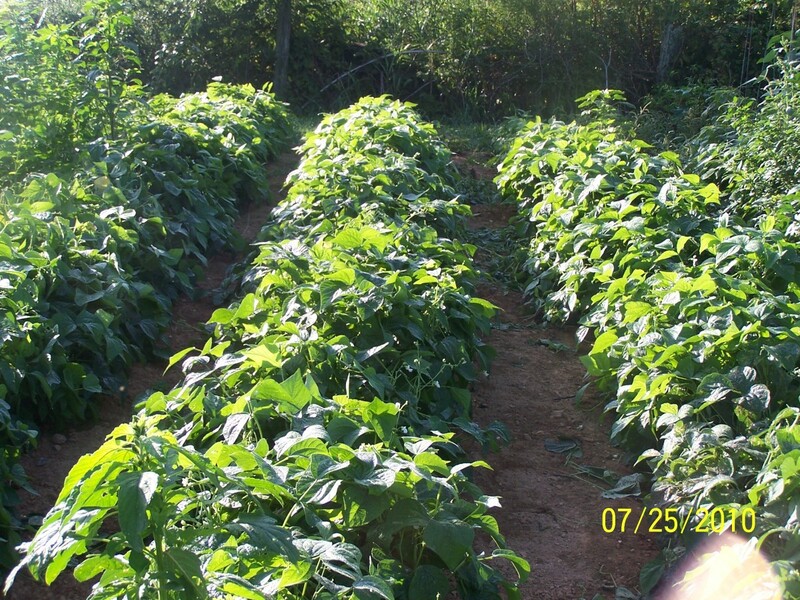 The fruit and vegetables are not only free, but organically grown. This is environmentally friendly as the vegetables can be harvested fresh, and taken straight home. No need for them to be driven hundreds of ' food miles ', shipped overseas etc. "Incredible Edible Huddersfield is a grassroots movement, its aims are to actively promote locally produced food through community action. We have lots of ideas for community gardens providing fresh vegetables and fruit, community orchards, and an aquaponics unit providing fish and vegetables. We need you and your ideas to help make it happen in your village, estate, road." Aims to increase the amount of local food grown and eaten in the town. Local businesses, schools, farmers and the whole community are all involved. A non-profit making organisation working in partnership with Transition Wilmslow, to make Wilmslow a more sustainable community. What is wonderful about these projects are that so many people and businesses have seen the potential, and tools, seeds etc are donated on a regular basis. Schools have become involved, volunteers go round every year planting more vegetables, fruit bushes, fruit trees etc, and the whole concept has become a community activity. This is reminiscent of the days of World War II when the 'Digging for Victory' campaign encouraged householders to dig up their flowers and grow food instead, only this goes one step further and encourages the planting in all and any available areas. Thankfully it seems local authorities have adopted the idea too, and although initially many areas may have been planted up without permission, it would have been hard to take someone to court for being caught planting a gooseberry bush on common land. It is refreshing to see this attitude taken by authorities, and the fact they now support the concept is fantastic. 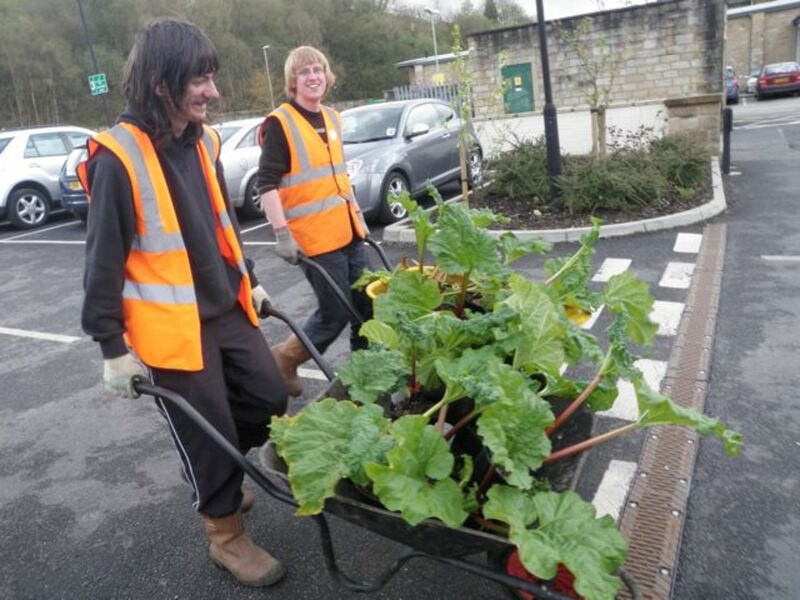 Within eight months of Pam Warhurst and Mary Clear's Todmorden project being launched, Calderdale Council, began to respond to the momentum, giving permission to plant 500 fruit trees around the local playing fields and looking for plots to turn into new allotments. 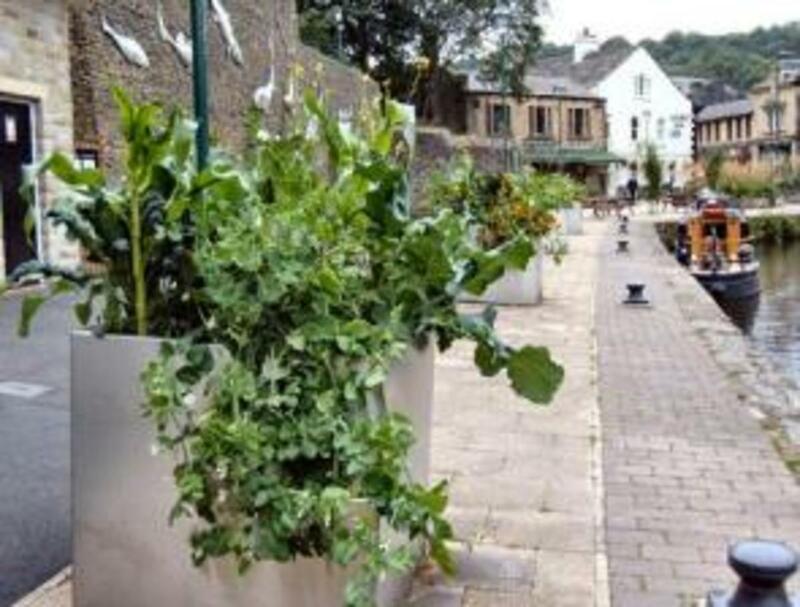 Clearly the momentum of this idea is spreading as many other UK towns and villages such as Wilmslow, Wakefield etc are now starting their own 'Incredible Edible' projects. Isn't it about more of us approached our local authorities, schools etc and tried to start similar projects as these can only benefit all of us in the long run! That is so sad gelmancadet, a community spirit is really so important for this idea to work. That said, sometimes actually starting something like this is what creates (or recreates) a community spirit, so perhaps if one person were to get the project started it would bring the community together bit by bit. 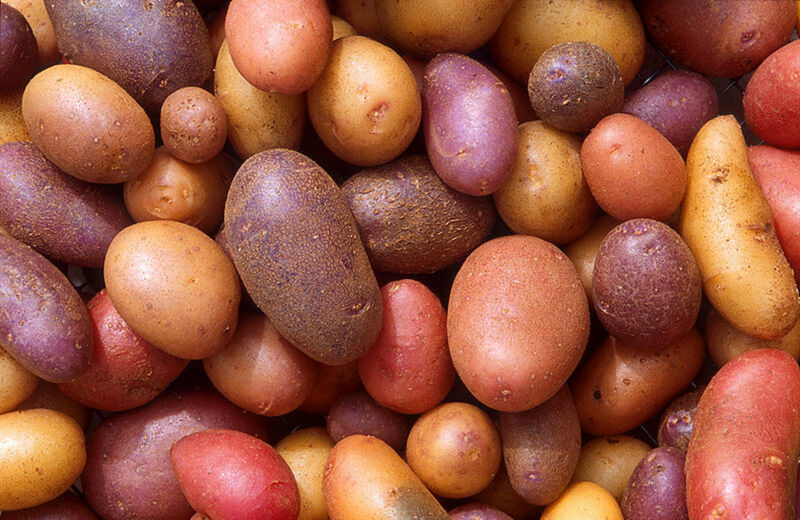 I am certain from what I saw of the programme that no spraying of any kind was done to these vegetables, not least of which because they were often grown on scrub land, in containers, or in beds mixed in with other plants that would not require spraying anyway. The emissions should not really be an issue, (if the veg are washed properly before eating) especially as plants clean up the air, breathing in gasses such as Carbon Dioxide etc and replacing that by producing oxygen as their own waste product. I would imagine that in the villages where this kind of growing is already in place, (and bearing in mind this is the UK), the traffic flow is minimal anyway, and the veg are not being grown on the edge of a busy London City street. I too think this is a wonderful idea, and was particularly impressed that many local gardeners voluntarily grew the young veg plants in their own greenhouses or gardens, simply to donate them to the 'Incredible Edible' project. Fabulous, if only more people would do this kind of thing for their local communities too. Who knows, one day this kind of growing may become essential with the population of the world growing at the rate it is. I do hope that if anyone does this in their local communities that they stress that the gardens be organic and not spray for insects or use herbicides. Even ornamental cabbage from most nurseries has probably been sprayed at some point in time unless it is certified to be organic (another good reason to grow your own from seed). Also, how close a growing area is to a highway or roadway should be considered because of emmissions. 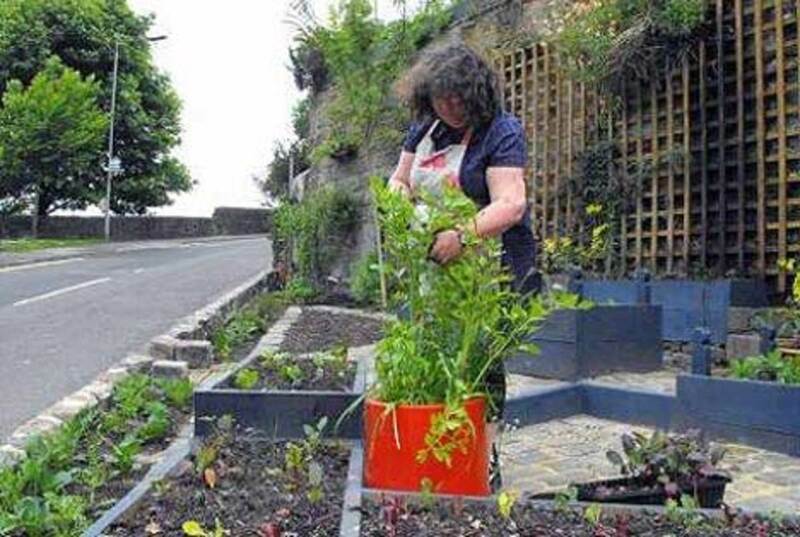 I think this type of community gardening is a wonderful idea and I hope this 'takes off' all over the world. I love the who idea too Steve. I might actually be doing a follow up article to this one as I am in touch with Norah Hamill from the Huddersfield project, and she says they have now advanced the idea even further and would like to talk to me to elaborate so I can write the article. This is brilliant and what the world really needs a lot more of! Inspirational! Hi BkCreative, thanks so much for your lovely comment. I am delighted by the support this whole concept has received. Perhaps there is hope more places will try this idea out, perhaps on a small scale initially, but gradually growing in size as they see the results. This make so much sense. Once we allowed ourselves to become dependent our food supply here in the USA became industrialized. We are eating garbage and paying good money for it. Yes, let's grow food - it will be local, fresh, affordable, healthy and on and on. And since we need it for survival it just makes sense to have our hands in it. Brilliant hub - and thanks a million. Rated up! Thanks for writing this. I love something "green" and I found it through this hub. I liked gardening too. Very inspiring hub. Have a good day! Thanks for commenting LG, I do believe the world would be better if all towns did this. Thankfully in this case the local authorities/politicians have 'come on board' and are backing the concept. All we need now is for many many more Politicians in other places, towns, cities, countries etc to do the same. In other words, we need a 'snowball effect'. They should do this all over the world. Politics are the weeds of the gardens that need pulling and recycled--composted. Hi William, thanks, I think it is a wonderful idea too, everywhere should be doing this. No, I am not familiar with Transition Towns, but would love to know more if you care to share, or to Hub on the subject and post the link here. That is a great idea, one that more towns and cities should consider! Are you familiar with Transition Towns? I love the idea of food growing all through town. Great hub! Hi Gus, exactly, Swiss chard is an excellent example of attractive vegetable planting, and as I illustrate in my hub on 'Growing your usual vegetables in unusual colours', there are many veg such as cauliflowers that can be anything from orange to purple. Vegetables can also be very attractive structure-wise, so using various heights, foliage and shapes can be very effective, e.g. the fluffy foliage of carrots, the leaves of frilly lettuce such as lollo rosso, the larger leaves of courgettes etc. Hi Misty - Wonderful article about some really useful things underway. I saw a very colorful display garden at the entranceway to our hospital. That mass planting featured the very edible Swiss chard (lucullus) plants, both the red stem and green stem varieties intermixed. As you plainly illustrated, there are a great many edibles that are also attractive as show gardens. Good points Dave. It all depends on where in the world you are too of course. Where I saw it done in Todmorden etc, you wouldn't have homeless on the streets, although a good chunk of the community do appear to get involved. The very nature of how a lot of the growing is done is that the vegetables don't need weeding or watering unless they are in containers. Growing on verges, in graveyards etc, they just get on with growing. Hard to explain unless you saw the television programme where Hugh went around the village and saw all the places the veg were growing in person. Mind you, I totally appreciate that the idea could be greatly expanded on if physically able bodied homeless people could make themselves useful and help with the planting of the seeds and baby plants, or could weed the more 'formal' vegetable beds. This would certianly work well in places where homelessness is a problem. I understand what you are saying here and I can see something maybe that you are not. Community Gardens like this,would give the homeless not just a sharing in the bounty, but also something to do too, as usually these gardens need watering and weeding some simple TLC. the homeless could provide this as a means of earning their share. Maybe you should think this further as a hub. That is nice to hear Dave. The next step is to do it in all public areas, so even those who don't, or can't help with the growing or purchasing of seeds, can at least harvest and eat the foods. Imagine how helpful this could be to people who live on the streets and have no money, or to low income families, and if the vegetables were literally growing all over the place there would be plenty to go around. There are many places today in the city of Toronto where apartment and condo buildings have started up community vegetable gardens. I think it a wonderful idea. 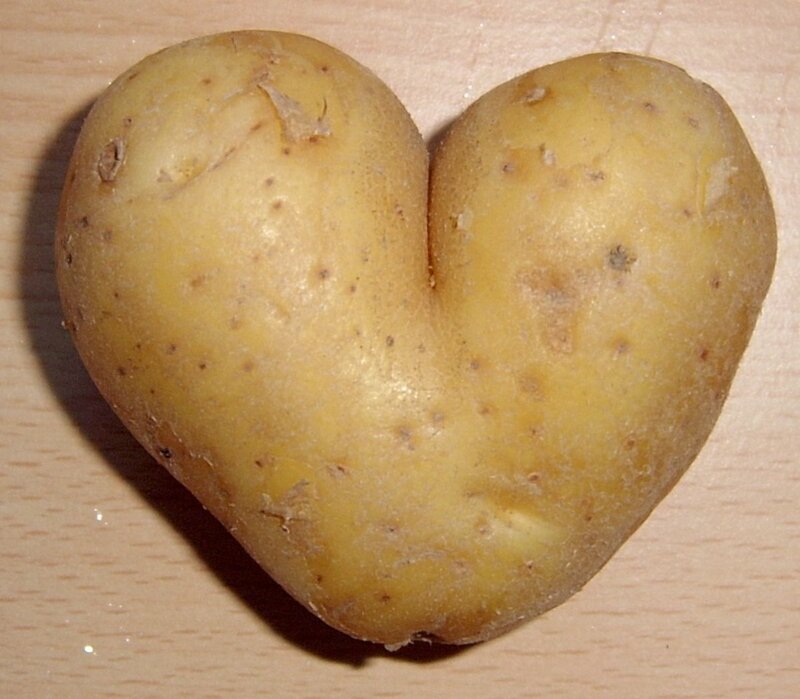 Hi Jandee, I love the concept totally, and even vegetables can be quite ornamental to look at when growing. Hi G-Ma, lovely to see you here. Well the idea has been going at least a couple of years now and is apparently working well. More and more towns and villages seem to be joining in, and I for one love the idea that even in a graveyard there can be new and sustaining life being created.